Since 1752 the town of Newington has had a library, and although the name and location of the library has changed many times since then, one thing remained constant; there were people in town devoted to serving and supporting the library. While there was not a formal Friends organization until 1961, without those who befriended and supported the library in the past, we would not have the treasure we now have. The present home of the Newington Public Library was built and dedicated to Lucy Robbins Welles in 1939. In March 1961 a group of Newington residents met to form a Friends of the Library organization. The aim of the group was to focus public attention on the services and needs of the Lucy Robbins Welles Library. Some of the first Friends sponsored programs were the newsletter and an Author-Illustrator Tea. The Friends continue to sponsor the design, printing, and mailing of the library newsletter, footnotes and Calendar of Events. 1979 – Rejuvenated and 350 members strong, the Friends organized and ran a successful used book sale which is now a semi-yearly event. 1982 - The first Apple computer for public use in the children's department was funded by the Friends. 1983 - Membership climbed to 550 families and talk began about how to support a referendum for the expansion of the library. 1983 - The Friends held the first bus trip - to New York City. 1984 - Friends purchase the first dozen videocassettes for the library to circulate along with a VCR to rent. June 1985 - the Friends hosted a Strawberry and Wine Reception for the unveiling of the scale model and plans for the library expansion. 1985 - the referendum passed by more than 3 to 1. 1986 - Friends organize over 100 volunteers to move books from the library to the West Wing of the Senior Center where the library would call home for the 18 months of construction. May 1986 - the Friends hold a "Going Out of Building Auction". Architectual elements of the library such as the stairway, the circulation desk and shelving all went to the highest bidder. June 1986 - Friends bought the library's first compact discs for circulation and a compact disc player to rent so that people could be introduced to the "new sound"
February 1987 - Friends conduct a "Love Your Library" drive to buy books for the new building. February 1988 – the newly renovated and expanded Lucy Robbins Welles Library opens. June 1988 - The Friends purchased the first public-use computer for adults to use for word processing, spreadsheets and database creation. October 1990 - The Friends held a book drive "Your gift can speak volumes" in response to an austere budget year. May 1992 - Funding for the purchase of the new on-line card catolog terminals is provided by the Friends. 1994 - Friends' membership rose to 900 families. December 1999 - The Friends vote to fund the first 200 DVDs and security cases for circulation to library patrons. May 2000 - the Friends march for the first time in the Memorial Day parade with the library staff. October 21, 2001 - Friends 40th Anniversary Celebration! June 2002 - the first Friend of the Year award is given to Rudy Remigino. June 2002 - Friends of Connecticut Libraries presented the Membership Committee of the Friends with the Outstanding Friends award at their annual meeting. 2005 - Wireless laptop computers, as well as a portable wireless access point are purchased by the Friends for the library. 2006 - The Friends purchase replacement tables and chairs for the Community Room. 2009 - The Friends purchase a shipping container to be used as storage for the book sales. 2010 AWE Early Learning Station purchased for the Children's Room. September 2010 to December 2011 - the 50th Anniversary Celebration: Celebrating 50 Years of Service kicks off at the Waterfall Festival. Part of the celebration includes the Golden Gala in June 2011 and We Love Lucy/Hug the Library event in October 2011. January 2011 - the first Wine and Cheese Social occurs as part of our 50th Anniversary Celebration. June 2012 - Friends Of Connecticut Libraries presents the Friends and the 50th Anniversary Committee a Special Achievement Award at their Annual Meeting. 2012 - Mural artist Heather Sawtell receives funds from the Friends to paint murals on the walls of the Children's room. 2018 - Mobile Shelving purchased that allows for the area under the Atrium to be opened up for special programming. 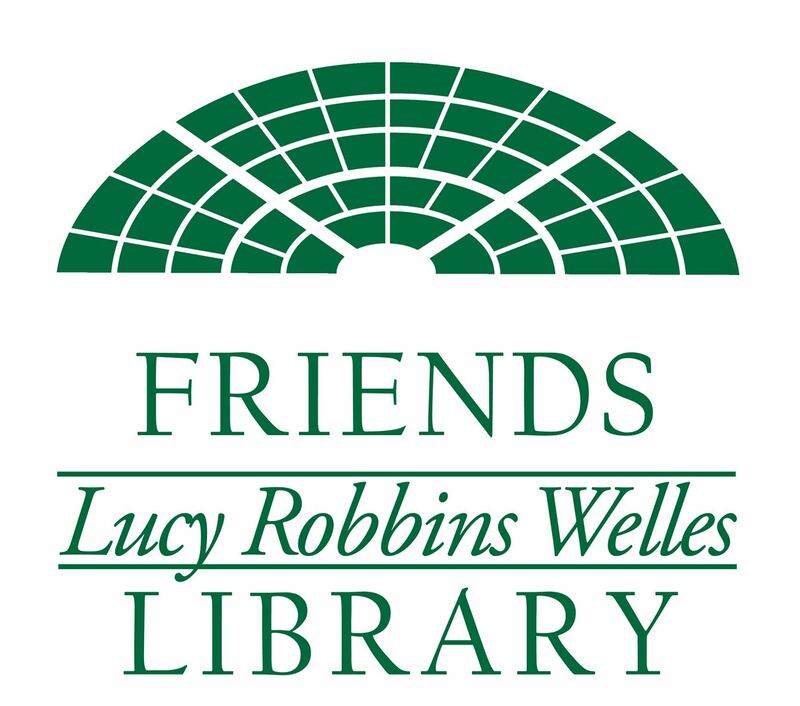 The Friends continue to serve and support the Lucy Robbins Welles Library by raising funds to support the Summer and Winter Reading Programs, the Museum and Attraction Pass program, special Children, Teen and Adult programming, the purchase of DVDs, eReaders, laptops and other electronic devices, beautification projects and much, much more.